Tree urns are a unique and spiritual way to pay tribute to a loved one. 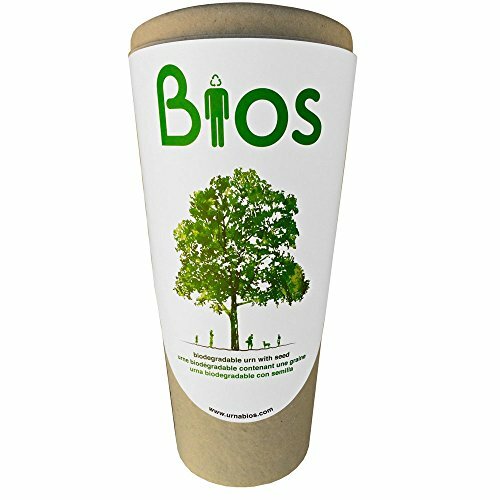 With most of us becoming more conscious of the environment, these biodegradable urns are the perfect compliment to our values. 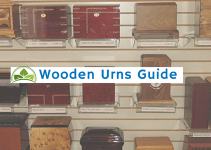 In this review, we’ll talk about how these tree urns work and what you need to do. After we review the top products on the market. More and more, we are becoming aware of how the earth has suffered from our abuse. Fortunately, a few dedicated visionaries have come up with ways to make end of life options more eco friendly. Their efforts have produced innovative biodegradable products that could heal the earth and solve the overcrowding problem. These green solutions have popped in the area of what you can do with ashes. Can you imagine becoming a beautiful tree after you die? It may be hard to visualize, but that’s exactly what will happen with a cremation tree pod. What are Cremation Tree Pods? 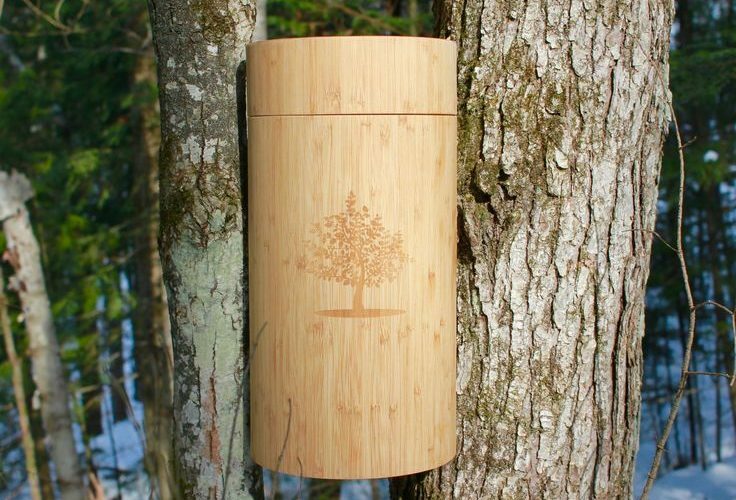 Tree urns are essentially a way to turn death into life. It’s a combination of burial and cremation, which turns the ashes into something that is amazingly good for the earth. A cremation tree pod provides the soil with necessary nutrients and helps to clean the air. It’s a living creation and a memorial to the departed, which lives on for many years. You will receive the necessary items with instructions. After the container is planted, the tree begins to sprout and the container dissolves. They are designed to hold all or most of the ashes of one person. However, you can place only a portion of the ashes. Some people purchase more than one tree pod to give to other family members and divide the ashes among them. That gives them a memorial as well. 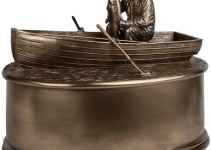 They are a small fraction of the cost for a traditional burial or interring a normal urn. The price is typically between $80 – $150, which we’ll discuss below. There are a number of quality products on the market which we’ll discuss. 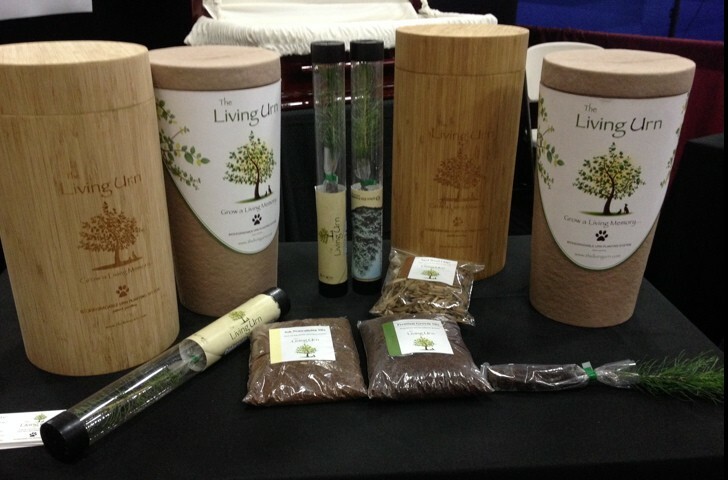 The Bios Urn is the most popular tree urn kit on the market. Inspired by an early childhood death experience, brothers Gerard and Roger Moliné, designed a product to turn death into life. It’s made from 100% biodegradable materials, with the choice of quite a few tree types. Their goal is to change the way people understand life. Their aim is to reinstate man into natures life cycle. 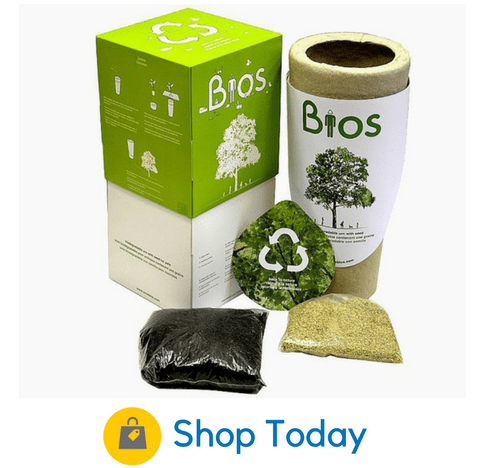 Bios Urn Package: What do you receive? Your package will come with the urn, coco peat, vermiculite, and planting instruction. They also send you a seedling, not a seed. That’s all you need. The instructions will explain how to put it together and the best way to plant. It’s an extremely easy process. Then you will watch it grow, knowing your loved-one is part of nature. 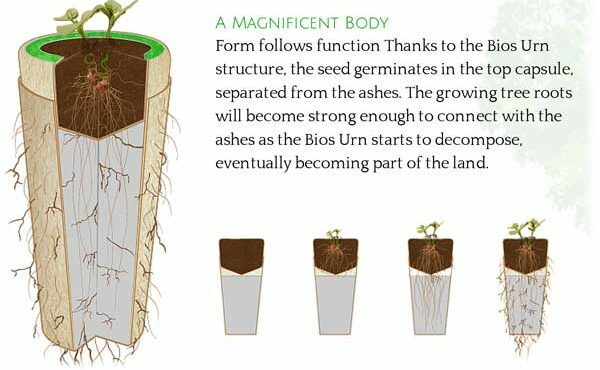 The Living Urn is the first cremation urn planting system. It’s made from recycled materials and is 100% biodegradable. It was developed by lifelong friends. After the death of one of their friends, they were motivated to find a special way to memorialize him and be kind to the earth at the same time. It’s a complex design, but super simple for you to plant. A wide variety of tree types are available from which to choose. You will receive them as a seedling (baby tree) instead of a seed. If trees aren’t your preference, you can go to your local nursery and purchase plant or flower instead. Many people plant it where they can see it every time they look out the window. You have a choice of an evergreen tree including, pine, spruce, or cypress, which will be sent to you immediately. Otherwise, you have the option of over 20 types of seasonal trees. You will determine your planting zone and it’s delivered during the optimal growing season in your area, to ensure healthy growth and survival. Your Living Urn arrives in a lovely bamboo shell, which many people use as a keepsake later. Inside is a biodegradable urn made from recycled materials. 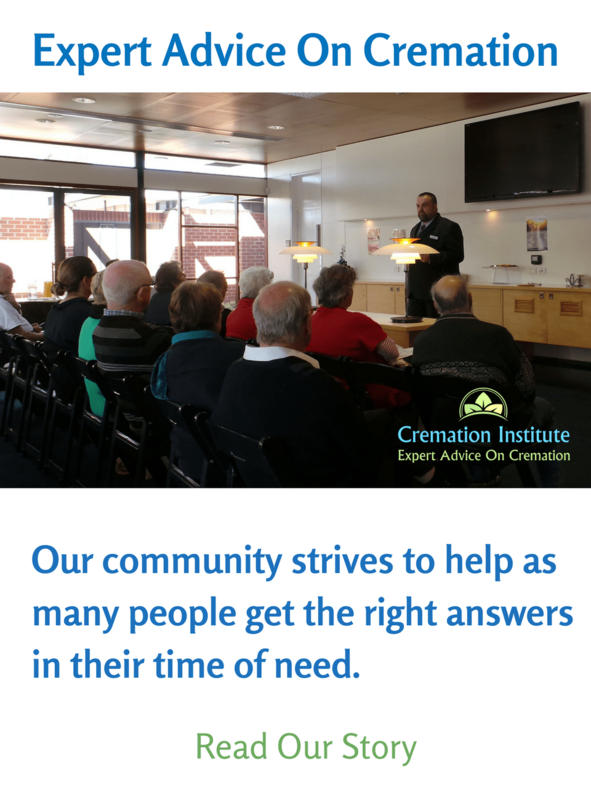 You will fill the urn with either the entire cremated remains or a portion if desired, followed by the seedling. RootProtect, which is a neutralizing agent, is poured on top of the cremains, followed by the soil mix, wood chips, and instructions. All are contained in the package. Then you are ready to plant in the place of your choice. A very easy process. 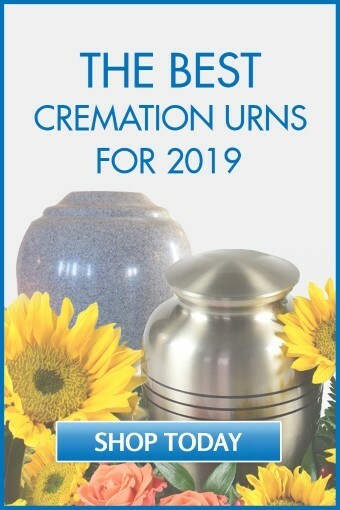 If you wish to purchase or find out more about the The Living Urn, find out on their online store. We could never forget our precious pets. They are part of our family and we want the best for them. That includes a memorial after they die. 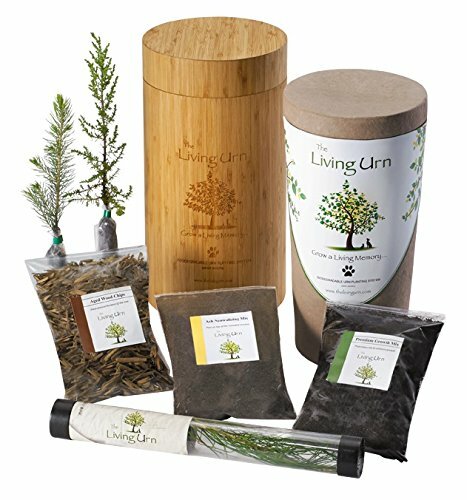 Both Bios Urn and Living Urn have cremation urn trees for them as well. 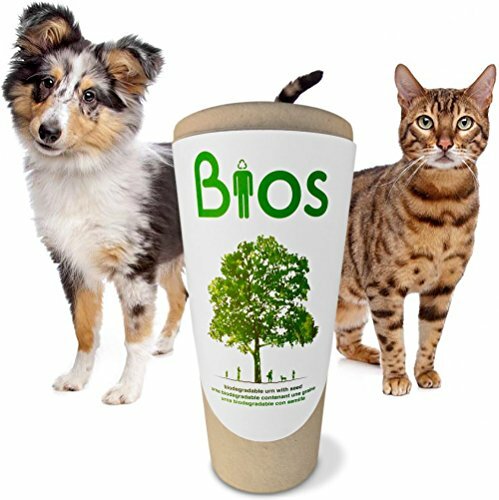 The Bios Urn is made for both humans and pets. You could plant a smaller plant or tree to honor your pet in the same area as the family. Or perhaps a flowering bush to climb a family member’s tree would be a touching option. As you stroll around your yard or sit on the patio, you can admire your furry mate’s tree or plant. The Living Urn is a perfect way to keep your pet alive. Watch a beautiful tree or plant grow with the life of your pet running through its veins. This version for pets does not include the tree seedling. All you have to do is visit your local nursery and choose the type of tree or plant that most represents your precious pet. 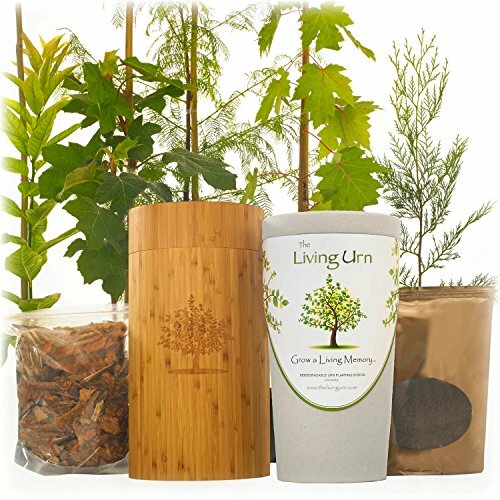 You will receive the system, which includes the biodegradable urn with premium plant mix, and wood chips. 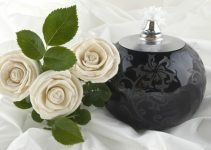 Also included is a lovely bamboo urn cover that becomes a treasured keepsake after you plant the urn. 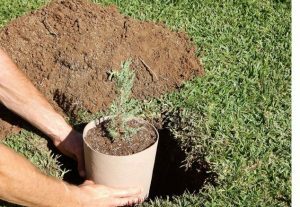 Following the simple instructions, you will plant the ashes along with your chosen type of tree, shrub, or flower in the ground or a pot. After it begins to grow, you’ll think of happy memories with your furry loved one, each time you look at it. Do you know of any forest areas that allow a person to plant a tree, I guess I’m just not sure my family can plant a tree in their own back yards so where can one plant a tree that is known to be ok with any city or state ordinances. I live in Oregon…the land of many trees & forest fires wouldn’t it be great to plant loved ones into areas that need trees.